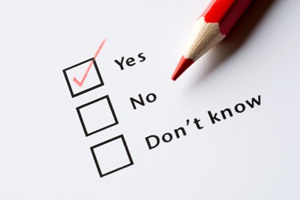 Daunted by the process for responding to the NHMRC Draft Report? ME/CFS SA has pulled together some information to assist with your submission process, including what you might say and how to submit. Closing date for submissions is 11:29pm (ACDT) 18th February 2019. Question 1(a): How well does the report present the difficulties faced by ME/CFS patients in receiving medical care? Question 1(b): How well does the report present the challenges facing clinicians in providing care, when there is lack of clarity on diagnostic and management tools and minimal professional education about the condition? Question 2(a): The research and clinical guidance recommendations accurately address the specific needs of ME/CFS community. Question 2(b): The research and clinical guidance recommendations provide an accurate representation of the current gaps in research. Question 2(c): The research recommendations inform the CEO of the most effective and strategic research options currently available. Up to 300 words is allowed for answering each question. You can save your work and return to the submission process. There is no automatic save function, so please remember to save your answers regularly. It is just as important to indicate those aspects of the report that you support, as well as those you wish to see amended. It may help the NHMRC if you are able to indicate which section of the report you are talking about when you make a comment. But the most important thing is simply to let them know what is important to you. Many people have expressed confusion about how to begin developing a submission. In particular, there has been concern about how to determine what sort of material to include under which of the five given questions. ME/CFS SA has created a document to identify the types of information that could be included under each question. For people who would like to focus their submission on post-exertional malaise (PEM), there are additional notes in a separate document, with quotes and reference material. Also, #MEAction Network Australia (MEANA) have produced a document based on member discussions, with some of the main concerns of patients described under each question. Many thanks to MEANA for this. Please remember to use your own words in your submission as identical responses will be disregarded. Registration requires an email address, name and address. After registration, an email will be sent to you to confirm registration. The email will contain a link where you create your own password. You need to respond to this email within a stated time limit. In the screenshot below, we have added an upward-pointing arrow (1) for the link to register, after which you can use the sideway-pointing arrow (2) for the link to set up a submission. On the each page of the submission site is a navigation list on the left-hand side, with those five parts. Click on each heading to complete the required details. At the bottom left hand corner of each page are the options to Save and Preview. Saving takes you to a page showing your details. Bookmark this page, and use the 'Edit' link to continue your submission. There is no auto-save function for your submission drafts. You will need to ‘save’ each time before you leave the page. At the bottom left hand corner of the NHMRC submission page are the options to Save and Preview. Saving takes you to a page showing your details. You can bookmark this page, and use the 'Edit' link to continue your submission. The submission pages will automatically log you out if you leave them unattended too long. Remember to save your work each time you take a break and to keep a record of your login details, so that you can log back in easily if you get timed out. When you are happy with your saved submission, remember to hit the 'Submit' button! The submission process allows for publishing, not publishing, or redaction of parts of your submission. This occurs through the form in the screenshot below. If you want to have your submission appear publicly, but without your name attached, you need to fill in an offline form and clearly document what specific personal details you do not want published. 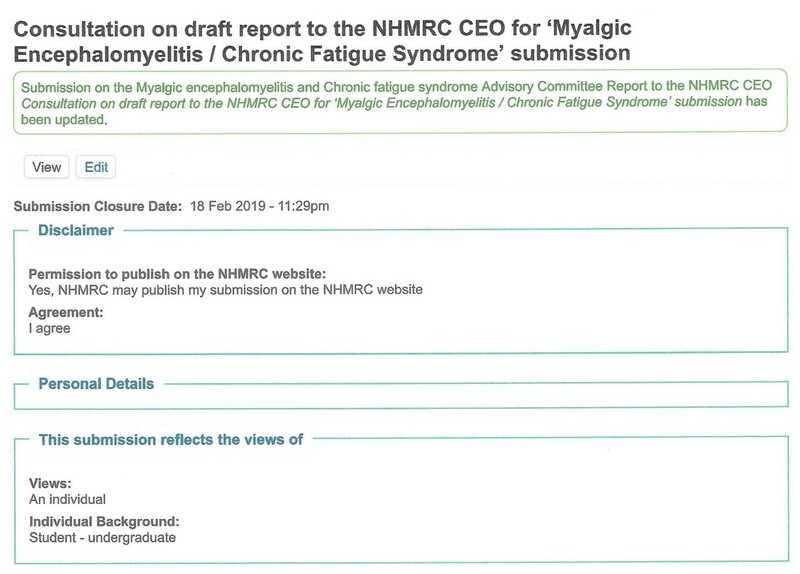 This form then needs to be emailed to: ME_CFS@nhmrc.gov.au by the close of public consultation on 18 February 2019. 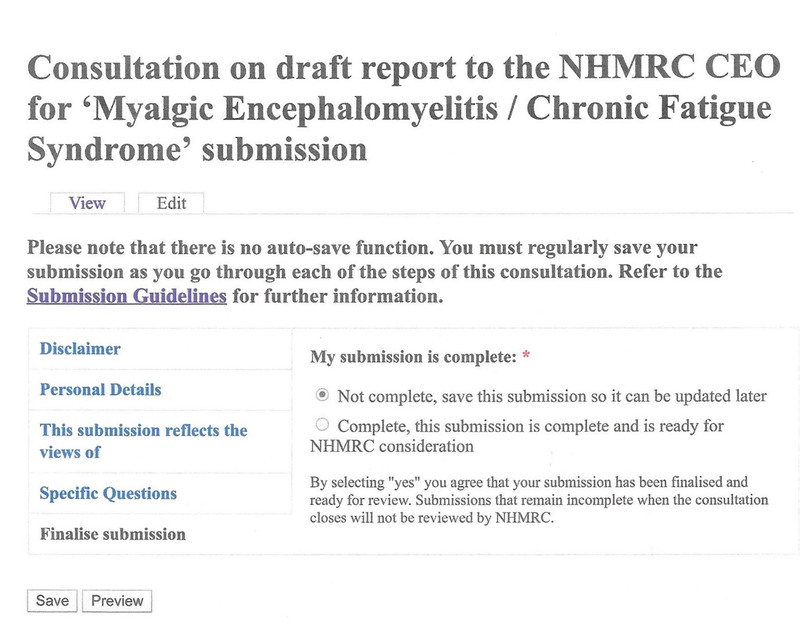 NHMRC staff can then manually input the submission information (without the personal information) into the public consultation portal so that the comments are captured in the system. 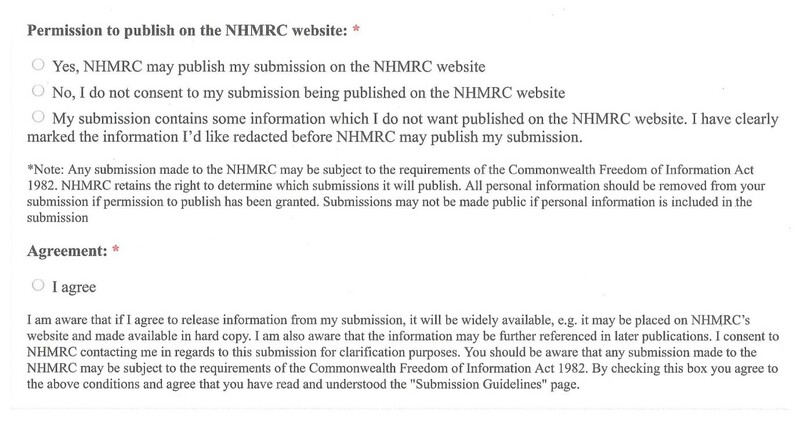 If you have difficulty with anything technical on the NHMRC website, please email ME_CFS@nhmrc.gov.au for assistance.